Five friends, celebrating life and making music together. If not now, when? On February 21st, 2013, the uber-talented Rob Morsberger & four friends, singer-songwriters Jon Albrink, Valerie Ghent, Tim Robinson and Ina May Wool come together for a special Songwriter’s Beat concert: Rob Morsberger & Friends. For nearly two decades, Rob has been a friend and inspiration to me personally. Since his recent diagnosis of terminal cancer, I have been amazed and uplifted by Rob’s courage and sheer creative output – as he says, “releasing as much material as time allows”. That his musical output has grown in the very face of the all-too real knowledge of facing a finite amount of time is a testament to his strength, musicality and perserverance. And, of course, as Rob acknowledged at a concert last week, with grateful thanks to his doctors as well. 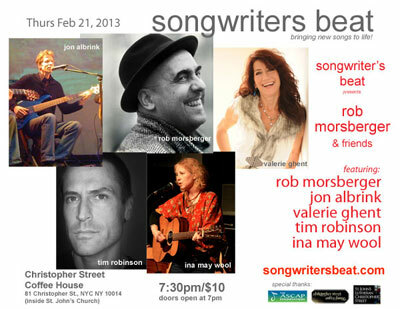 Rob has performed many times at Songwriter’s Beat over the years, and in the face of all he has contended with over the past 15 months, the five of us are truly happy to be able to come together on Feburary 21st to share music, songs and friendship. We will also be celebrating the Feb 15th release of Rob’s new double CD, “Early Work 1986-1995″. Let us rejoice in each and every moment we have to turn to one another in love, in friendship and in song. Christopher Street Coffee House, 81 Christopher Street, NYC 10014. Cover $10 – all proceeds to artists. Songwriter’s Beat – bringing new songs to life & artists to new audiences. Our gratitude and thanks to the ASCAP Foundation for supporting Songwriter’s Beat.